Featuring a black dial with gold graphics and champagne registers, this Rolex Daytona chronograph reference 6265 exudes glamour. Reference 6265 was introduced to the market approximately in 1970, and was made until 1987. While the reference was mainly cased in stainless steel, limited amounts were also cased in 18K or 14K yellow gold. Reference 6265 was in production for almost 20 years, yet no more than 2000 examples were cased in gold. From the late 1970s and onwards, gold examples featured a movement number engraved on the plate behind the balance wheel. Research suggests that this was related to the officially certified chronometer movement. 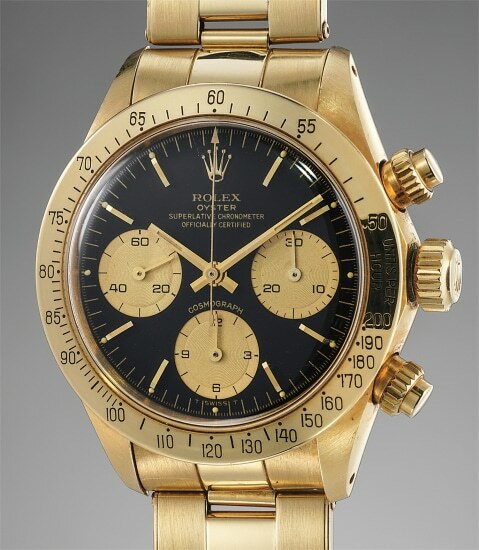 Around this period, Rolex modified the dial layout for gold versions, and the ‘OCC’ designation was printed on the dial. In overall very appealing and in well preserved condition the present watch with its striking combination of gold livery, black dial and champagne subdials will be a true pleasure to wear.